A lot of people are thinking that home theater décor is very hard to do. But actually it is not as hard as it seems. Whether you want decorate your living room as home theater or you really dedicate a special room as home theater, you can easily decorate it. That way you will create comfortable place for you to enjoy movie time with your friend and family with more serious atmosphere. If you do not know what you need to do to create your dream home theater, you can try to follow our tips below as inspiration. First thing first, you must soundproof the room that you want to use as home theater. We all know that the real theater is closed to prevent the sound from coming out from the room and you should also try to do that. If you have more budgets, then you can easily install insulators in the walls ceiling and even flooring to prevent the sound to come out from the room. But for more budget friendly option, then you can try to use sound curtain and even use very think blanket. Do not forget to insulate every gap especially little gap under the door for more soundproof home theater décor. After the soundproofing is done, then now it is time to plan for your wall design. You can try to just paint the wall if you want simple design. Or if you want something more elegant, then adding wooden panels will really make the design stand out more. Mixing wood panels on the bottom of the wall with plain wall on top can be cheaper alternative rather than having the wall fully covered with wood. Just add several crown molding for even more luxurious home theater décor design. 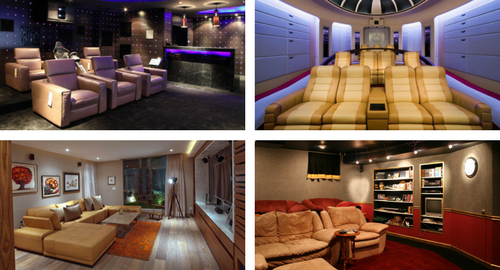 After the wall, of course we also need to think about the home theater décor flooring design. We all know that the favorite flooring choice for home theater is still carpet flooring as it is also used on real theater. However that is not mandatory since it is your own home, and then you can also try to use hardwood flooring as your other room inside the house. But if you really want to use carpet, then you can try to add small section rug near the seating area as decoration which will also add more texture to the floor. Seating is a crucial thing to think about when you design home theater décor. Not only you use it to seat on the home theater but it will highly affect your comfort. There are many options that you could use as seating, try to use individual theater seating for absolute comfort as everyone will get their own seating. If you want warm family feeling you can try to use big section sofa or even put several small sofas around the room. Add a few pillows or big bag bean seating on the floor for friendly atmosphere. You can also use sofa bed as option for more comfort. There are a lot of home theater décor accessories that you could use to make your home theater more interesting. Of course you should have several of your favorite movie poster framed to decorate the wall. You can also put movie items on the rack or just hung them on the wall. Place a trolley as a refreshment center which is very useful for every home theater viewers. And if you have extra budget, try to get mini popcorn maker and place it on the corner of your room. This popcorn maker is a must have item for every theater. There is no exact thing that you must have in home theater so actually everyone could have a home theater inside their house. As long as you think of your budget and find alternative that better suits to what you want to spend, and then you can also create your dream home theater within reasonable budget. The key is to find things that are in reasonable price and not forcing to have something that you could not afford. For example as it is your own house, and then if you could not afford to have soundproof room, then just choose a room which you might think will create less noise such as your basement. For the seating you can use any sofa you have in home or just place a bed for more comfort. You can also try to place a big rug in the middle of the room, throw big pillows, and then you are done with the seating area. Anything is possible with little creativity so try anything you think of for home theater décor.